Digital Parenting: Is This Bold Parenting Move a Yes or No? Here is the story of one mother that took to the internet to publicly shame her daughther to teach her a lesson about....publicly shaming. One mother found out her daughter had been cyberbullying peers on the Internet and the following was her response. This morning, a young girl is getting a taste of the abuse she was apparently serving up to her classmates, thanks to her innovative mother. Yesterday, reddit user AngryCOMMguy posted a photo (pictured) of a downtrodden young girl holding up a yellow sign. 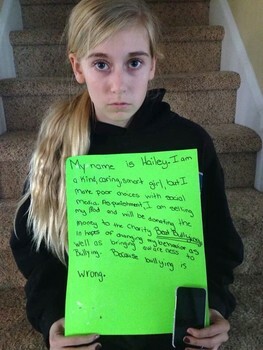 The young girl - who identifies herself as Hailey - is a cyberbully. At least, according to her mother. Apparently, Hailey's mother discovered that her daughter was abusing fellow students (at least we assume it was fellow students and not just some random people), via the Internet. As a result, Hailey's mom decided the best course of action was to have her daughter sell her beloved iPod and give the proceeds to Beat Bullying, a charity that works to combat bullying in all its forms. Taking a break from this story, I think it's safe to say that this is a time-tested parental move: if your kid acts like a jerk, you take something away from them. Make them feel the sting of their malfeasance. This mother, however took her punishment one step further. Rather than keep the incident in-house, as it were, Hailey's mom had her write out the punishment on the aforementioned sign so that she could post the picture for all the world to see. The resulting shot is reminiscent of the kind of shaming tactics that are popular among social media savvy pet owners these days. The difference is, pets have no concept that they're being discussed on message boards around the world. Since the extent to which Hailey was being a jerk have yet to come to light, it's impossible to say whether or not she deserves the punishment she's receiving. It does seem a little odd that Hailey's mom would use public shaming to teach her daughter a lesson about public shaming, but sometimes the best remedy for a problem is getting a taste of your own medicine. Read the full article here, and let us know in the comments if you think this parenting technique is a good idea or a bad one!